Thank you for your question "Why does carbon dioxide in a solid state sublime?". This phenomenon can be explained by looking at a type of graph that is known as a Phase Diagram. Phase diagrams are graphs that show what physical states (solid, liquid, or gas) a certain type of matter will exist in at a given pressure and temperature. The link below shows a phase diagram for water. In the phase diagram, the y-axis is pressure (in atmospheres, or atm) and the x-axis is temperature (in Celsius). If you select a certain pressure and temperature combination and find that point on the graph, that point will sit in the region that corresponds to the physical state of matter that the material will exist in. 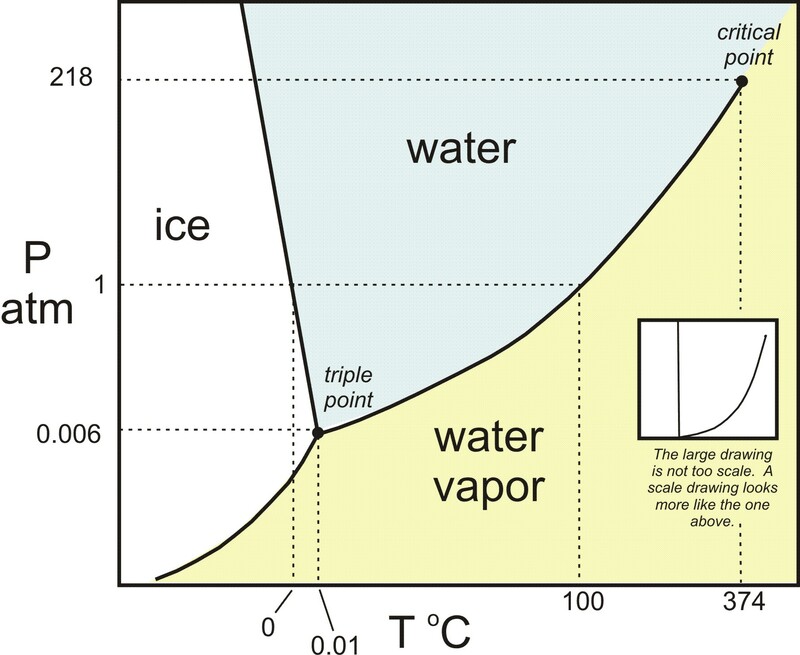 If you start at the y-axis, at the pressure of 1 Atmosphere (normal ambient pressure), and draw a horizontal line across the graph (increasing temperature), you will see that water goes from ice (below 0 Celsius) to water (0-100 Celsius) and finally to vapor (above 100 Celsius). If you draw a horizontal line across the graph at a pressure of 1 atmosphere, you will see that carbon dioxide goes directly from a solid to a gas (sublimes!) at a very low temperature of -78.5 Celsius. Carbon dioxide physically cannot exist as a liquid at atmospheric pressure. So, when you see a chunk of dry ice (solid CO2), and you observe that there is gaseous CO2 coming off of it, this happens because the surface of the dry ice is in contact with the room temperature air (at ~22 Celsius) and so the molecules on the surface of the dry ice block immediately go from the solid state to the gaseous state. Now, why this phenomenon happens is a little more complicated, and has to do with the intermolecular forces between CO2 molecules. CO2 is a non-polar molecule, and the molecules are attracted to each other only by a very weak force called the "van der Waals" force. Since the molecules are very weakly attracted to each other, CO2 molecules very readily go from the solid state to the gas state at low temperatures. Great question! The process of phase transitions depends largely on the material properties of the molecule. Intermolecular forces (bonds) play a large role in determining when and how a substance changes phases. Generally, the phase depends on two factors: temperature and pressure. Plotting the phases on a graph with these two factors as axes is called a [pressure-temperature] phase diagram. Most compounds show three phases when cooling at a constant, room pressure (i.e. water), but sometimes compounds like carbon dioxide skip the liquid phase altogether and transition directly to a solid when cooled. This is because the pressure at normal atmosphere is too low for carbon dioxide to condense to a liquid. However, we can isolate the gas in a high-pressure vessel and then cool it to exhibit a liquid phase. Nevertheless, many materials can exhibit wildly different phase behaviors. For instance, if you had water at high pressure and at 0 degrees Celsius and decreased the pressure, the order of phases would be liquid -> solid -> vapor! Any solid sublimes, actually; it's just that carbon dioxide has a fairly high rate of it. The temperature of the Earth is also too warm for carbon dioxide to be stable as a solid, so it vaporizes. The process is very similar to boiling, except that the atmospheric pressure is too low to allow carbon dioxide to become a liquid, so it "boils" directly from solid to gas. Note: I invite you to go and visit the east side of the Sierra Nevada during the winter. It is a desert, so the humidity is low enough that any body of water continually evaporates (sublimes), but in winter it is also cold at least high enough, so the snow that falls can evaporate directly into the air. It's the same process as carbon dioxide, but of course snow is water, not dry ice. That is a good question! In short, it is all about pressure. We usually think of melting and boiling as something that happens at a fixed temperature, but it actually depends on pressure just as much as temperature. You might have heard that it is harder to cook at high elevations like in the Andes or the Himalaya. This is because there is less air (lower pressure) at high elevations. At lower pressures, water boils at lower temperatures, so it takes longer to cook food! If the pressure is low enough, water-ice (HO) will also sublime. Dry ice (CO2) works the same way. It sublimes, because the pressure at the surface of the Earth is too low for liquid CO2. 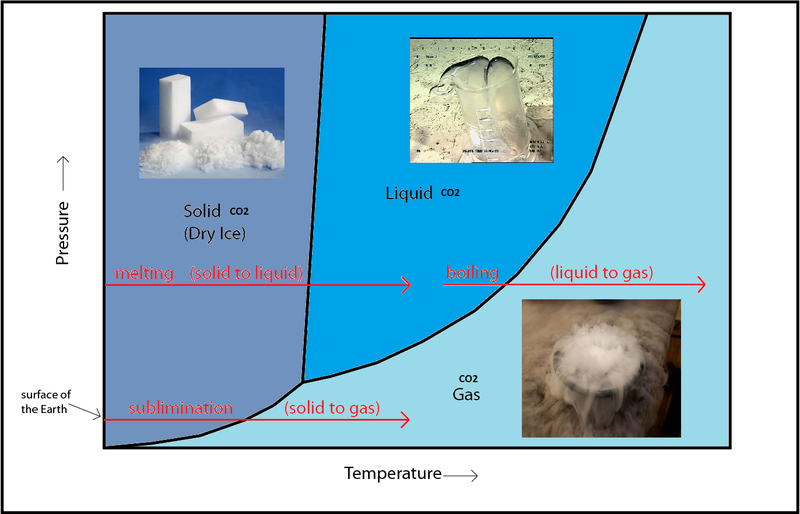 If you could take the dry ice to a place where the pressure is much higher (like the bottom of the ocean, or a special laboratory) you could actually watch it melt, then boil, just like H2O at the surface of the Earth. That is a get question. Solid carbon dioxide does indeed sublime rather than melt first and then turn into a gas. This has to do with the bonds that hold carbon dioxide together. The carbon dioxide molecule is symmetric with an oxygen molecule at either end of a carbon molecule. This means that the molecule has no electric dipole, there is no one side of the molecule that is more positive or more negative than another part of the molecule. This means that the attraction forces between stable molecules is not very strong. There are of course more subtleties to the interactions between the molecules that determine what state the carbon dioxide takes, but the result is that liquid CO2 only forms at pressures above 5.11 atmospheres. The following link will give you the phase diagram for carbon dioxide. A phase diagram is a graph showing what phase a material will take given a certain pressure and temperature. Those are the two factors that determine a compounds phase (in normal circumstances anyways... there is a plasma state, but let's not get into that just yet). Temperature gives energy to the molecules, making them want to break apart, and pressure squeezes molecules together, making them want to arrange themselves in an ordered fashion so as to take up the least space possible. I hope the diagrams on Answer #1 clear a few things up.